The article presents the results of the research of different kinds of non-academic professional, expert, media and civic activities of Humanitary disciplines instructors. The author studies the motivation of these activities, their factors and significance. The author presents the classification of Humanitary disciplines instructors that are active outside the university. The research was based on detailed interviewing. Key words: civic activity, Humanitary disciplines instructors, media activity, social practices, sociology of education, expert activities. This article is devoted to the actual problem of law education at school. The author focuses on the institution of the Children’s Rights in educational organizations. The author also proves the idea that the formation of citizen’s legal qualities starts in educational settings. The need for legal training for all educators and pupils is clarified. В данной статье рассматриваются особенности формирования коммуникативных умений учащихся начальных классов, при этом особое внимание уделяется анализу методологических подходов бурятских лингводидактов по проблеме развития речи младших школьников на бурятском языке. Ключевые слова: младший школьник, речь, устная речь, развитие речи, методологические основы, умение, коммуникативные умения, методические исследования, формирование. Ниитэлэл бага наһанай һурагшадай харилсаанай шадабари бүрилдүүлгын онсодо зорюулагданхай, тиихэдээ онсо анхаралаа буряад лингводидактнуудай эхин һургуулиин һурагшадай хэлэлгэ хүгжөөлгын ажалнуудай шүүмжэлгэдэ зорюулагданхай. Тулгалха үгэнүүд: бага наһанай һурагшад, хэлэлгэ, аман хэлэлгэ, хэлэлгэ хүгжөөлгэ, методологическа үндэһэнүүд, шадабари, харилсаанай шадабари, методическа шэнжэлэлгэнүүд, бүрилдүүлгэ. This article is based on a paper, read at the 43rd International Philological Conference at the St. Petersburg State University, timed to coincide with the 150th anniversary of the birth of the famous German linguist, Ferdinand Wrede. The main area of Wrede’s interest was the German dialectology and dialectography. Being the successor of George Wenker, Wrede had a significant influence on the development of the German dialectological atlas. Wrede’s dialektographical studies had a significant impact on the well-known Russian philologist Viktor Zhirmunsky, who conducted collecting and research activities in German colonies in the USSR in 1920s. Presented in the paper, fragments of two scientists’correspondence refer to this period and reveal the origins of some V. M. Zhirmunsky’s ideas concerning research in the German settlements in the USSR. Falunina E. V., Shmonina N. V.
At present, the increasing interest in instructor’s personality is observed in the sphere of higher professional education. The requirements for his professional competence are rising. He should be able not only provide basic information but also activate students’ scientific knowledge. The given article considers the issues related to a process of professionalisation of an instructor teaching Psychology Sciences within the academic discipline «Psychology of social interaction» at technical university. Falunina E. V., Miroshnichenko E. V.
The authors of this article consider cross-cultural communication as «an important characteristic of teacher’s personality in the modern multicultural educational environment». A model of development of future teachers’ cross-cultural communication in the context of modernization of higher professional education is developed by the authors as a result of experimental studies. The description of this model is given in this article. Key words: cross-cultural communication, elements of cross-cultural communication, a psychological and educational model of cross-cultural communication. Falunina E. V. , Falunin V. F.
This article considers a problem of defining psychological mechanisms of development of tolerance personality in psychology. The concept «psychological mechanisms» as a content category used for describing a process of intrapersonal changes and individual mental transformations is determined on the basis of scientific works analysis. The definition of tolerance as a personal quality is given. The mechanisms of its development are proved. The article considers a problem of structural features of the polimodal perception of seven year children with general speech underdevelopment in comparison with normally developed children. The content and the results of basic training are analyzed. The article considers the perspectives of the country school development and discusses the importance of the labour education. The author explains the specific life of the country people which value is agriculture labour. The Kulish school developed a system of labour education according to A. S. Makarenko’s traditions. Such a system made it possible to involve all pupils into a process of the co-operative activity, particularly, into farming. Key words: labour education, social competence, country school, teenager, industrial activity, the Makarenko’s heritage, farm, employment assistance, ecology, moral culture. The results of the research of readability and school textbook simplicity by means of widely used psycholinguistic tests, namely the Flesch readability test and the Fogh’s index, are shown. The research was conducted through the use of textbooks at both primary and secondary schools. The data related to the compliance of school textbooks and the psycholinguistic criterion of readability and simplicity, according to the educational levels (type of school or age), are given. It’s obvious, according to the given data, that school textbooks content is often difficult to understand for pupils and isn’t appropriate different age groups. This article analyzes the historical and methodological aspects of the Russian and British media education development. The author discusses the main goals and objectives of media education at different stages of development, presents a comparative analysis of the theoretical concepts of media education in Russia and the UK. Key words: Media education, stages of media education development, the theoretical concepts of media education in Russia and the UK. * The article was written with the financial support of the grant RHF "Strategy contemporary British media education and its impact on the Russian media education" project № 13-36-01001. Project Manager ­ I.V.Chelysheva. This article describes the methodology of media education lessons at school and university. This methodology is based on using a literary analysis, literary imitation, theatrical and in-role performances as well as artistic and imitative creative exercises. The author of the article considers the complex of playing and creative exercises, which structure includes elements both of the media education theory and the media works analysis. * The article was written with the financial support of the grant RHF "Strategy contemporary British media education and its impact on the Russian media education" project № 13-36-01001. Project Manager — I. V. Chelysheva. 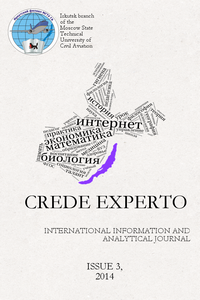 Murashkina N. A., Grigoreva I. V.
The article presents the results of the analysis of educators’ scientific and publication activities in Eastern Siberia in the field of media education (at the beginning of the XXI century). The educator’s and researcher’s media education experience is described. 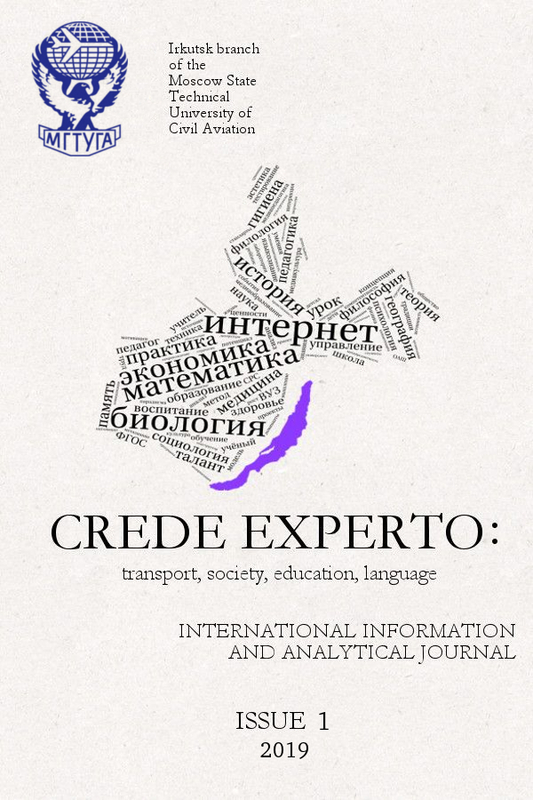 Ivanova L. A., Verbitskaya O. M.
The article deals with one of the most burning issues of modern higher education – media competence’s forming and development in the sphere of foreign language teaching. Key-words: media education, media literacy, mediatized socializing, foreign language communication, intercultural interaction. The article presents the experience of civic education and patriotism formation. The ungraded school students studied the history of their village. The village of Baikal can be called a «creative harbor». First writers and artists settled there more than 40 years ago. Both artists and their works made on Lake Baikal are discussed here. Key words: civic education; moral values; creativity and culture; project activity; Baikal; artists; writers; village; nature; paintings; works. The article considers the essence of a new principle of pupils’ moral development and upbringing – «a moral example of a teacher». The substantiation of a new axiological upbringing approach «pupils’ peacemaking upbringing» is given. Teacher’s preparedness for this approach realization is discussed. This article is devoted to the actual problem of teaching the literary analysis at senior school. The author of the article tells not only about specific features of a literary text, but also gives the practical advice on its analysis on the example of the I. Shmelev’s story «Russkaya pesnya». The main idea of the article is the modern Russian language study at school only in a synchronic aspect as a static system of elements is not sufficient. The current state of the Russian language system reflects its temporal variation (dyachrony). It is expressed in the clarity, asymmetry, graduality and variability of the modern Russian language system. That’s why teaching the modern Russian language at school should be carried out in both the synchronic and dyachronic aspects. Ostapovich I. Iu., Musinov P. A. This article considers main stages of development of law education at high school in Russia starting from the 18th century to the present days. This period is characterized by the intensive intergration of Russian education into the global cultural and educational space. The issue of time in the context of traditional science is discussed in this work. The aim of the study is to analyse the historical perception in relation to the distinguishing features of the belief system of various epochs, which gives an opportunity to understand the social processes of the past and present eras. Key words: time, culture, historical perception, endophysics, synergetics, germeneutics. This article examines the Soviet government attempts to turn the competitive nature of workers and peasants into a tool to increase their working capacities. The decreasing competitive effectiveness of the socialist system and its subsequent replacement with the capitalist free-market system is noted as an inevitable process. This article is devoted to a consideration of scientific activity of a teacher as a basis of organization of pedagogical activity to basing of scientific competence as a condition, realization of which lets a teacher rich a high professional level. In the article the author reviews the theories of the basic andragogical terms and psychological theories influenced andragogy. Some recommendations for organizing teaching adults, including teaching in distance, are given. The article deals with the issues of continuous life long education of each graduate by involving him in the online learning communities. One of the conditions for self-education of every student is the choice of appropriate and accessible information and communication technology in e-training. Key words: life long education; online learning communities; information and communication technology; e-training. In article experience of the constitutional control in foreign countries and possibility of use of their powers in practice of the Constitutional Court of the Russian Federation is analyzed. Powers of Committee of the constitutional supervision are investigated. It is offered that some of them gain today special relevance regarding investment of the Constitutional Court of the Russian Federation with them. Practice of the Constitutional Court of the Russian Federation is analyzed where it is specified that granting to the Constitutional Court of the Russian Federation of powers on implementation of preliminary constitutional control of drafts of the laws establishing or strengthening criminal, administrative or other types of responsibility looks positive. Besides, elements of preliminary constitutional control could play a positive role regarding elimination of «excess rule-making». Key words: Constitutional court of the Russian Federation, power, preliminary constitutional control, «excess rule-making». This article is devoted to a study of using functional peculiarities of modern German mood-related gestures. The results of the gestures analysis including the details of their usage situations have been shown. This article deals with the use of colouratives (words describing colour) in teaching French on different language levels (basic, intermediate, advanced). These exercises make vocabulary learning more effective and improve skills in a system of general education.